In the Ichidian Universe, The League and their ruthless assassins rule all. Expertly trained and highly valued, the League Assassins are the backbone of the government. But not even the League is immune to corruption. Command Assassin Nykyrian Quikiades once turned his back on the League - and has been hunted by them ever since. Tortured hero, Damsel in Distress. Pure Kenyon! Atlanta has become the battlefield between human and demon. All her life, Evalle Kincaid has walked the line between the two. Her origins unknown, she’s on a quest to learn more about her past... and her future. When a demon claims a young woman in a terrifying attack and there’s no one else to blame, Evalle comes under suspicion. Now she’s on a deadly quest for her own survival. It's not easy being the heir of a demon overlord. But in Invision, Nick is determined to thwart his destiny and get into a good college. To be more than his genetics and prophecy foretell. No one is ever going to tell this stubborn Cajun who and what he really is. Or how to live his life. Not even the Fates of the Universe. But now that he and his team of ancient gods and demons have claimed the Eye of Ananke and he sees the missteps of the future, he has to battle the demons within, which are far deadlier and more treacherous than any he's battled before. All the while his archnemesis is back and determined to reclaim his place as the harbinger of Armageddon. Even if it means killing Nick and barbecuing everyone he loves to do so. 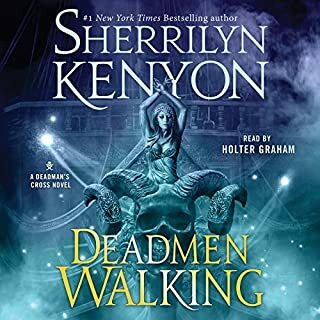 "Meanwhile back at the ranch, ..."
Would you try another book from Sherrilyn Kenyon and/or Holter Graham? I am a longstanding Kenyon fan, so of course, I will pick up more from her. And, Holter Graham is one the best narrators in the business. I look for books he narrates all the time. Together, they are one of the most addictive combos out there. In this latest iteration, Xev, and his narrative, stands out as the most memorable character for me. My favorite scene takes place at aunt Mini's house. There we get substantial chunks of backstory that progress the narrative, and enlighten dangling relationships between significant characters. Do you think Invision needs a follow-up book? Why or why not? This book, as others have commented, stands as a bridge to the storyline. Thankfully, I know there are plans for several more books. If this was the last book, this would have to go into the annals of, "bad... bad..," endings--with "Heroes" and "Alphas." I can only infer that this book served several alternative purposes--other than being a great stand alone story. 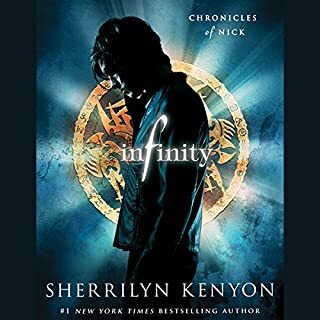 If you were to pick this book up, as a first read, in the "Chronicles of Nick" series, you will be severely disappointed and uninspired to go back and get the rest. However, for those devoted followers, this book serves as a hilarious narrative that fills in the blanks with several character's storylines. At the same time, it also provides superior plot twists that real you back in even deeper. Nevertheless, I must point out that some of the derived relationships and associations appear clunky and contrived. For example, Zev's relationship with Nick is presented with the subtlety of a 400 pound man doing a cannonball--off the high board--in the water hazard at the US Open. However, it lacked the "oh my God" interest, I believe she was trying for. It comes off more as a, Whisky-Tango-Foxtrot," surprise that changes the tone of the relationship. For those of us that follow the series, this doesn't flow in the same narrative style we are use to from Kenyon. Nor, does she take enough time to feather out this relationship in this book or the last. This is just one example, and there are several more in the story. Further, I miss Simi's role in this story. Her parts, again, seam contrived and provide very little explanation for her presents. Simi is like, 'Martin's Brotha-Man... from the fifth floor," and we never get enough of her. Fortunately, Kenyon always leaves us wanting for more. But, historically her role is more intertwined and complementary to the progression of the story. This time, it comes off as an afterthought, and Graham narration of her did not help: Next time less Kate Jenner, more Dora the Explorer. In addition, it seams that this book presents itself as an inspirational gateway to the Dark Hunter series. Which is fine, but misleading. Several of the dreamscape novella's that take place in this book suspiciously align with books in the Dark Hunter series. And, to become equally vested in those characters you would have to pick up those books as well. Now don't get me wrong, two of my all-time favorite books are "Asheron" and "Stixx." However, this one takes it overboard. There's just not enough character development in this story to inspire that kind of, "needle in the hay stack," search throughout that whole collection. However beyond all of the shortcoming, the insight and cliffhanger provided in this story make it essential to those following the story. More, it's hilarious. Nick and crew are as funny as ever, and the pace was great. I have read it twice already, and plan on going back to see if I can clear up some the relationship issues I haven't been able to follow. Worth the read. Good book overall. I would give the book 5 stars overall but had some issues so I am giving it a 4 since it was so good and I read it in one day. The only real two problems I had was the voice of Simi. It was to harsh and grating at some point when her voice went from the high we love to deep and grating with a squeak that killed my ears, but she is not in the book long so there is the plus to that. The original was better I have to say. The other was the ending. It was not as satisfying as previous novels in the series, but its like part one to a movie that ends with a twist, and will pick right back up in the next book. Not as much action as others in the series but a lot of WTH going on which I loved. So many surprises, laughs, and touching moments. I will still be getting the next book because Kenyon is an amazing author and knows how to tell a story. So be prepared for mostly build up to the next book. Was worth waiting for and the next one is too. The story itself felt like it had too many things happening at once, but at the same time it was kind of slow. Going back in time, going forward in time, people kidnapped to Asmodeus, Cherise dating Bubba, Nick freaking out about them dating over and over ...and over, backstories on freaking everyone , at length, in detail, powers, demons, lions and tigers and bears. Oh my. This story was all over the place and it was hard to follow at times. Where to begin? This is the seventh book of the Chronicles of Nick series and continues it's uneven quality. 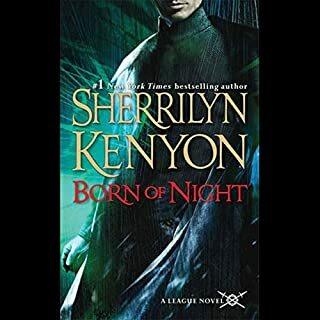 While far from the worst in the series this most definitely not the best installment and I can't help but wonder if Mrs. Kenyon isn't showing strain from trying to maintain too many series at the same time. The Pros: The comedy is here in full force and is one of my main draws to the series and the writer. if you've read one of her works you know what to expect and this lives up to some of her best in terms of laughing out loud at a few comments. The plot is a little bit more complicated and this reads much more like a piece in a series than the previous books. There is more character development of the side characters. More Kirin and Ash, which is always good. Explains a little of the confusing bits and does a good job setting up for the next book. The Cons: unfortunately for all the good this is far from a perfect book, or even one of Kenyon's best. There are a lot of her monologs about self confidence and anger that could be cut or shortened and not really lose anything because we’ve heard them before. The characters repeat themselves, honestly after 7 books we don't need to hear Nick reiterate his confidence problems every twenty minutes or how weird he is. To much characters saying "I love you" at every chance, we get it move on. Uneven pacing, in the book two side characters go missing or abducted and our Nick sets off to save them shows impatience, determination and damn the consequences that we’re used to. However then he spends the next hour and a half of the book chatting with a newly introduced character and another 40 minutes on trip to the future. The book coasts over rather important bits of story, ie Soul Mate reveal. Yes sadly there is soul mate reveal, didn’t need one but well we have one. She twists her world's mythology into a pretzel, again. I thought Beth was Set's daughter, apparently not according to this book. Thought Nick, now with his full powers, could use the primordial gods has chew toys, again apparently not. And I thought the six original gods were you know the first ones, but apparently they had parents too which were more powerful than them, surprise! There are tie ins to the nearly forgotten dream hunter series with 30 minutes explanation of a series with only four books, don't need this sort of thing in the middle of a book when I’ve already read those books. Rather obvious foreshadowing, oh look I know who Nathan is after the first hour. There are random short stories piled in which break up the main story and pacing though they do explain a lot just could have been done better. The return of super whiny Nick! Not I'm almost 18 Nick worried about college and the impending death of people but whinny Nick. Resurrect the hapless Nick that without powers cant fight at all despite being trained for five years at this point, not nick that beat Nior into bloody pulp Nick. Next the narrator, Mr. Graham did an awesome job as usual with one except. His Seemi voice was inconsistent, it went from the expect tenor sing song to a burping base. This really through me and didn't like at all, give me back the old Seemi voice! In the end I did actually enjoy this book and if you have read the rest of the series you'll love this instalment. However, sadly, there are still many part that could be improved. I want them improved because I love this series and want to be able in good conscious to give an installment five stars. This book was awesome. I can't wait to see were this newest plot twist is going, the epilogue was something else. We find out some stunning information in the epilogue like why Ambros had Nick get the eye and who the new enimy truly is. Clear you seduel because you will want to read this book in one setting and will dread every moment you have to wait to see what happens next. That being said you should be warned that this book serves more to advance the series plot then anything else. 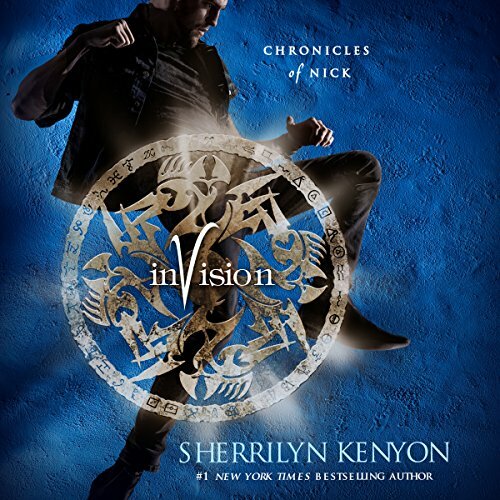 A great book that's fast paced and will leave you wanting more, in the best of ways, Invision leaves you with a bit of a cliff hanger and will make you wish that a year had already gone by so you could read the next book. 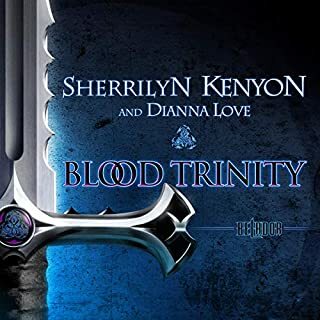 Sherrilyn Kenyon does it again!! loved it. Amazing...as always!! But she always does a fantastic job on all her books. I haven't found one yet that didn't send me on an amazing fantastical journey! Have you listened to this guy?!! If you haven't purchased any of the Chronicles of Nick, you are missing out. Holter Graham is one hell of a narrator. He has completely outdone himself bringing Nick and the rest of the Zoo Crew to life. I really like this series but this audiobook is work to listen to. Very confusing, jumps around, does not flow smooth. I hope it was easier to understand and follow in print.